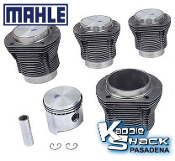 Genuine 85.5mm AA Performance Pistons and Cylinders kit to complete your 1600cc rebuild. Genuine 87mm AA Performance Pistons and Cylinders kit to complete your 1641cc rebuild. 88mm pistons & cylinders will slip right into a stock case without machining. The heads will need to be cut for 90.5/92mm. They have even thicker walls than 90.5mm cylinders, making them extremely durable. Upgrade to a 1679cc for more power. 92mm pistons and cylinders are a great value and provide maximum cooling. Great choice for 1776cc or 1904cc. 90.5mm pistons and cylinders are a great value and provide maximum cooling. Great choice for 2110cc. 92mm pistons and cylinders for your 1835cc. 94mm pistons and cylinders are a great value and provide maximum cooling. Great choice for 1914/1915cc, or a 2054cc. 94mm pistons and cylinders are a great value and provide maximum cooling for monster VW motors! Forged pistons and cyinders are stronger and more durable than cast or hypereutectic ones. They are used in the most demanding of performance builds and applications. If you need the absolute best for your build, these are it. Fit Type 1 and Type 3 VW engines. Forged pistons and cyinders are stronger and more durable than cast or hypereutectic ones. They are used in the most demanding of performance builds and applications. If you need the absolute best for your build, these are it. Fit Type 1 and Type 3 VW engines. Forged pistons and cyinders are stronger and more durable than cast or hypereutectic ones. They are used in the most demanding of performance builds and applications. If you need the absolute best for your build, these are it. Fit Type 1 and Type 3 VW engines. Set of 4 cylinder shims for setting deck height by shimming the cylinders away from the case. These fit the stock (non-cut) cases and cylinder sizes. Available in .010", .020", .030", .040", .060" and .090" increments. Can be stacked to achieve perfect deck. Set of 4 cylinder shims for setting deck height by shimming the cylinders away from the case. 94mm and 92/90.5mm are pre-clearanced for 8mm or 10mm studs. Available in .010", .020", .030", .040", .060" and .090" increments. Can be stacked to achieve perfect deck. Set of 4 cylinder shims for setting deck height by shimming the cylinders away from the case. 94mm and 92/90.5mm are pre-clearanced for 8mm or 10mm studs. Available in .010", .020", .030", .040", .060" and .090" increments. Can be stacked to achieve perfect deck. Why use a 40+ year old rod that has been "rebuilt" a ton of times when you can buy brand new forged stock connecting rods that are made to factory specifications. Fit Type 1 and 3 engines. 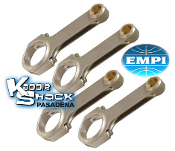 EMPI Forged 4140 Chromoly I-Beam Rods - 5.394" EMPI Forged 4140 Chromoly I-Beam Rods - 5.5"
These forged connecting rods are a great upgrade over stock. They're super strong, They feature 3/8" diameter super strong rod bolts, and ARP bolts are optional, as well. They are stroker clearanced to minimize contact when running a larger diameter crankshaft. Great value! These forged connecting rods are a great upgrade over stock. They're super strong, They feature 3/8" diameter super strong rod bolts, and ARP bolts are optional, as well. They are stroker clearanced to minimize contact when running a larger diameter crankshaft. Great value! These forged connecting rods are a great upgrade over stock. They're super strong, They feature 3/8" diameter super strong rod bolts, and ARP bolts are optional, as well. They are stroker clearanced to minimize contact when running a larger diameter crankshaft. Great value! Forged chromoly H-Beam rods are stronger than I-beams, and the foundation for any high horsepower VW engine build. These feature 5/16" rod bolts, and ARP bolts are optional. Great rods for the price!